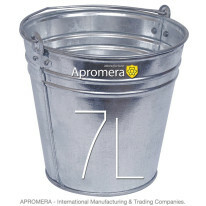 Superb Metal Galvanized Bin is manufactured by APROMERA, which is located in London Britain, UK. This product’s application is as extensive as our globe, this article is, literally, needed everywhere: in households, agriculture and so on. In other words, it is very useful. 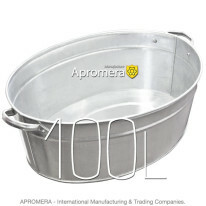 Besides, the trough is covered with sealing compound which almost completely eliminates the possibility of leakage. The container is quite durable and reliable. This container is an ideal solution for designers and decorators. It can be difficult to find something to suit the interior. In such cases it is better to take a plain pot and turn it into a piece of art. As for the advantages of the material, there are some of them: the material is eco-friendly, easy to take care of and durable. These containers have a waterproof bottom, usually used for growing plants. In other words, the size of the container resembles that of a box or a vase. 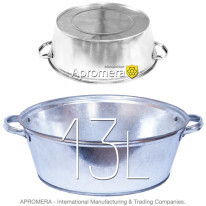 It is perfect for keeping potted plants and can be equally used for planting flowers. 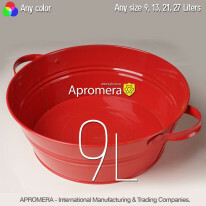 This container is well suited for cooling champagne, wine, beer, for bars and parties. It looks nice and has a simple design. It will help you create a relaxed atmosphere. It is ideal for home, bars and nightclubs. Put the ice in the tank, then place the bottles with drinks in this container. Wait for 5 -10 minut, and enjoy cool drinks. 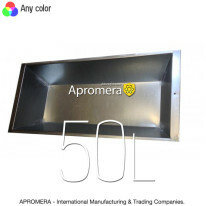 Metal Galvanized Bin is often used to store and carry around the construction site various substances and bulk materials necessary for a solution. Any solution container is a box welded from sheet steel having reinforced metal corners. This solution container can be equally used in winter. At temperatures below 0 ° C galvanized containers do not crack upon impact as plastic ones. Production made of galvanized steel of 0,55mm thickness and a high content of zinc, which makes it much more resistant to rust and corrosive environments.